She knows this book backwards and forwards, knows everything about it, the bent corner of the cover, Nan’s penciled-in notes on the inside back cover, next to the ruler and the line drawings on the endpapers. Illustrations fill the middle section of the book, the pages glossy instead of matte and the drawings are exactly how she remembers — the bottoms of the drawn stems covered in dirt, little arrows pointing from the page into the cap. The book falls open where the pages pull away from the binding, the page of waxycap illustrations. These are the Smurf mushrooms, their perky little red caps like roofs. She loves the melodrama of mushroom names – the ones that sounded like the names of evil superheroes in medieval Europe – Jeweled Deathcap, Destroying Angel, Bleeding Fairy Helmet, Deadman’s Fingers and Poison Pie, and then the good guys – Pink Hairy Goblet, Flimsy Veil, Golden Trumpet and Weeping Widow. 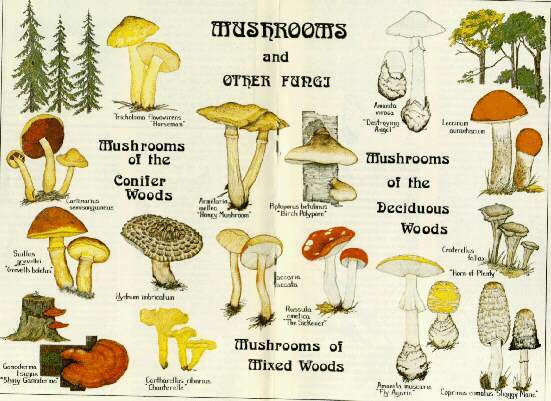 You could make a whole cartoon with these mushroom names. You could populate an anthology of kids’ stories.